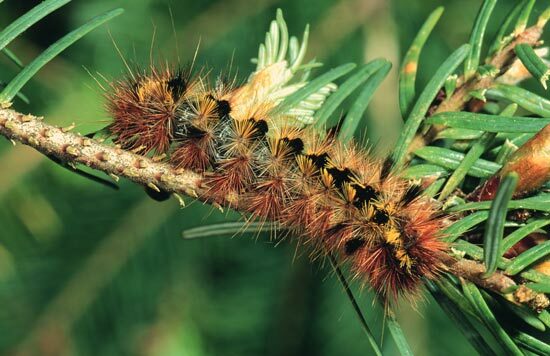 The silverspotted tiger moth is a common and occasionally damaging tent-forming defoliator. Normally only one to three tents occur on a tree but occasionally a large number of tents can be found on individual trees. Damage principally occurs on open-grown trees in urban or park-like settings and tends to be mostly aesthetic as the buds on defoliated branches remain undamaged and grow normally during the spring flush. By mid-summer the fully elongated current year's growth makes it difficult to detect branches where defoliation occurred. Mature larva to 37 mm long. Head, black unmarked. Body, black with middorsal tufts of black hairs, subdorsal clusters of yellow hairs and lateral clusters of rust coloured hairs. Long lateral tufts of black hairs on the first and second abdominal segments. This species overwinters as a third- or fourth-instar larva. 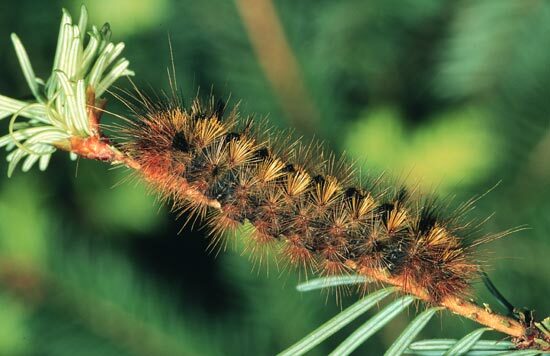 Caterpillars feed sporadically throughout the winter in small 10- to 20-cm long tents. Larval feeding increases in early spring (March-April) as the weather warms. A colony remains on one branch completely stripping it of needles for up to 1 m from the tip. By mid-April the larvae leave the nest and feed solitarily for another 2 to 3 weeks. During May and June the mature larvae are often observed wandering on the ground as they seek out sheltered locations in which to spin cocoons and pupate. Adults emerge from mid-July to mid-August. Females lay up to 450 eggs in clusters along needles and twigs. Eggs hatch from mid August to mid-September, first- and second-instar larvae feed gregariously inside a loose 5- to 10-cm long web during the fall.